When I press "Users" right below the logo on the main page, I am presented with a search engine. 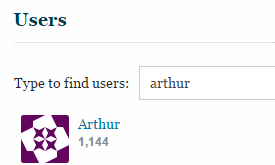 Here I can type in the name of a user, and get a list of all users with that name. That's me. I clicked it, and it went to my profile, so there's no doubt. However, I have a lot more than $1\,144$ reputation. What's going on here? Not the answer you're looking for? Browse other questions tagged bug status-bydesign reputation search users . Why the sudden jump of 100 points in my reputation ranking? Some $\LaTeX$ is going out of date?